This was my summer for exhibiting in North Carolina, meaning I drove from our mountain home in Jonas Ridge to Hickory and to Chapel Hill for installations and a reception in late May and early June. To my relief, everything went smoothly. At the Hickory Museum of Art, my collaborators and I were warmly received and expertly assisted by their professional staff. And I was very impressed with the permanent collection of contemporary folk art and a temporary exhibit of fine-art crafted furniture also on display. The Hickory Museum of Art is definitely worth a visit. In Chapel Hill, the public arts coordinator helped the two of us scheduled for summer exhibits to navigate the available exhibit spaces, located around the recently updated municipal offices and conference rooms. Both exhibits have been excellent experiences for me, and I appreciate these opportunities to gain some exposure for my work and to meet and collaborate with others who love art. Here are short articles on each exhibit from Carolina Arts, an online arts magazine dedicated to summarizing visual art openings and events in North and South Carolina. And here are a few pictures with a little description of each exhibit. Most of my effort went into logistics and so picture taking took a back seat this time. 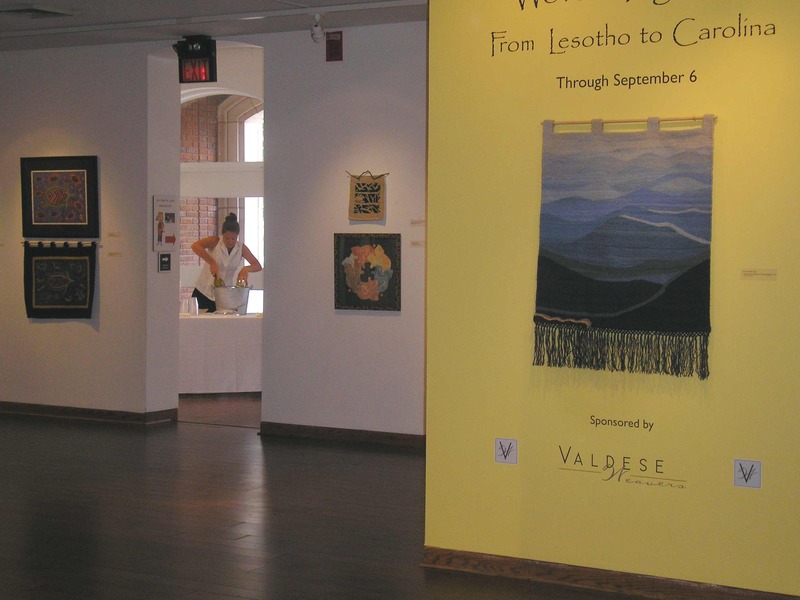 “Woven Together: From Carolina to Lesotho” presents a selection of tapestries and rugs designed and woven by craftswomen at a weaver’s coop in Maseru, Lesotho. Added to these are contemporary paintings, wall hangings, and rugs by me and Linda Elksnin, an artist friend who was inspired as I am by these weavers’ work. From 2009 to 2013, we commissioned the tapestry weavers to transpose our original designs into works of hand-dyed mohair wool and cotton. This opportunity for cross- cultural collaboration originated when Carl started an environmental consulting job in Lesotho, bought tapestries from some of the weavers, and began to make regular trips back and forth. I took these photos just as the reception, graciously provided by the Valdese Weavers of Valdese NC, was about to start. The two men are Nick Elksnin and Carl Trettin. 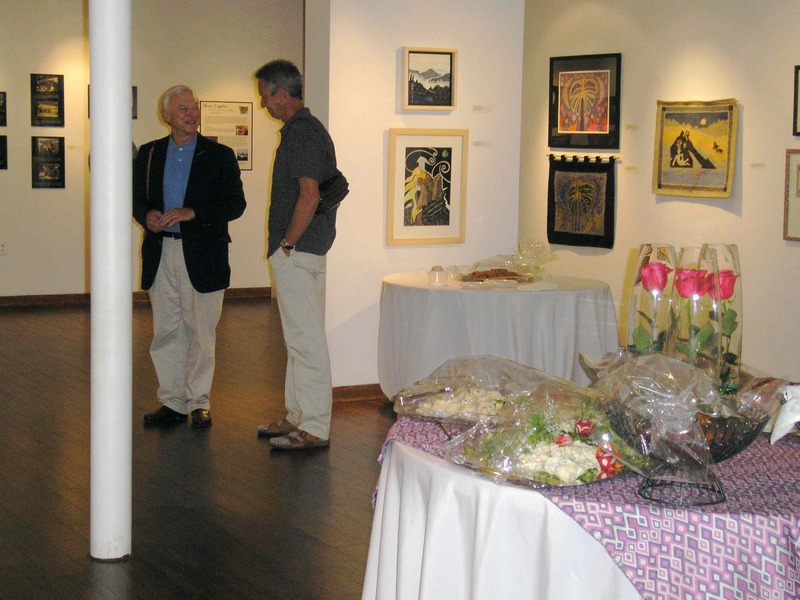 Our exhibit, along with the furniture exhibit, is up until September 6. 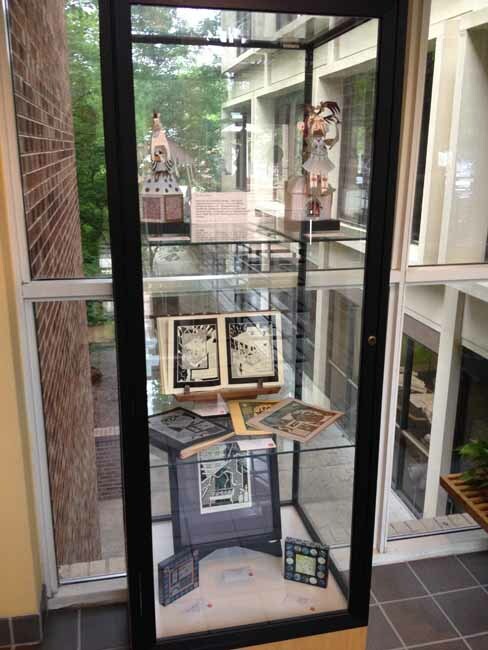 My other exhibit, titled “Geegaws and Ghostlies: Southern Storytelling,” is hosted by the Public and Cultural Arts Office of the Town of Chapel Hill, NC in their municipal town hall. 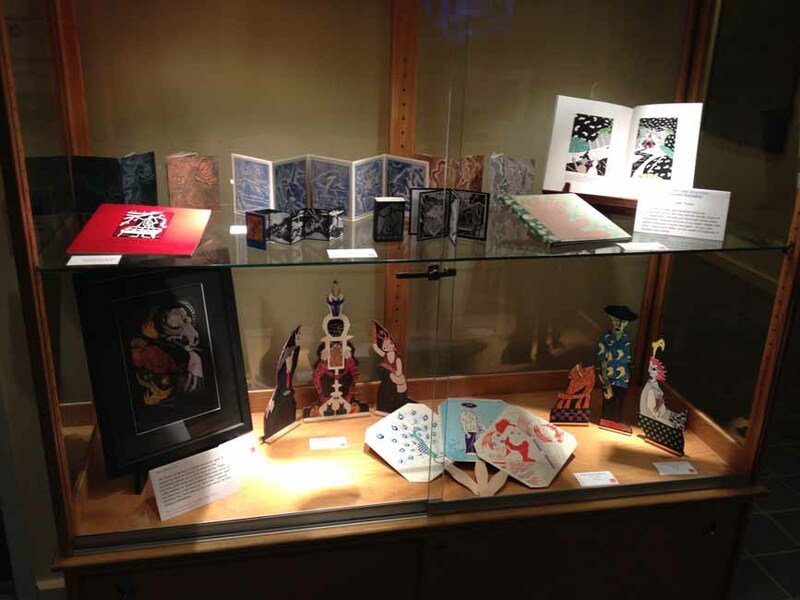 Included in this exhibit are handmade books, paper animations, miniature pictures of cut-paper collage, and jigsaw sculptures of wood and paper. The exhibit’s purpose is to encourage viewers to reflect on the wealth of traditions in southern storytelling. 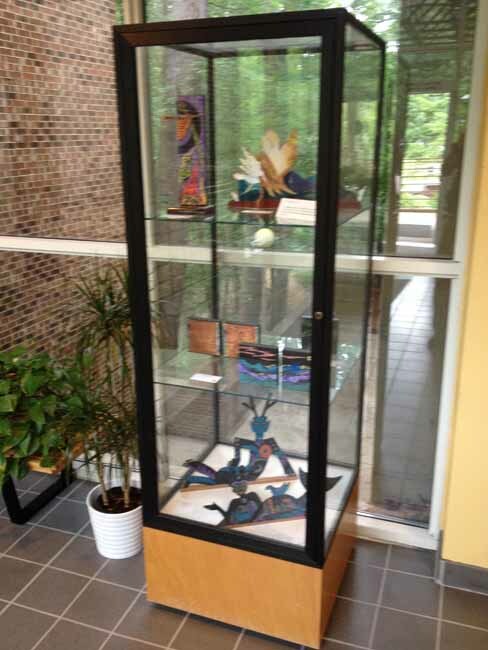 Objects are arranged in three glass cases, one each pertaining to Southern Lit, Blue Ridge Lore, and the Far-Out South. This exhibit closes August 27. I grew up in the Appalachian "Bible Belt" of East Tennessee in the southern United States, listening to banjo music and gospel lyrics as well as the Beatles. As a kid, I was curious about religious rituals like speaking in tongues and snake handling but resistant to the fundamentalist thinking they involved. Flannery O'Connor's tales of religious fanatics, con men, bigots, and the spiritually bereft or ambivalent resonate for me. Despite having traveled widely and lived in other places, I am (as so many Southerners claim to be) permanently "South haunted." 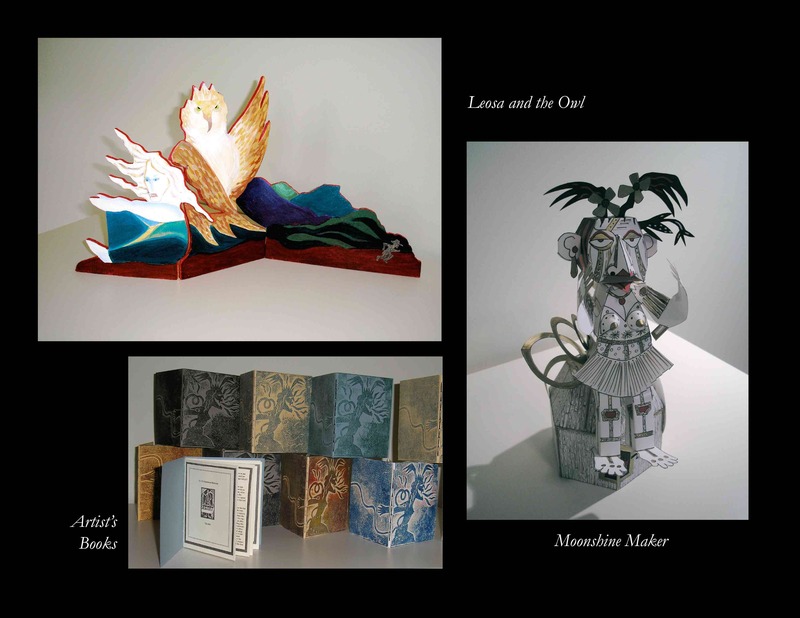 I returned to making art full time in 2011, following a career as a teacher, researcher, and consultant and after raising two sons. I’m convinced the delay enriched rather than impeded my growth as an artist. 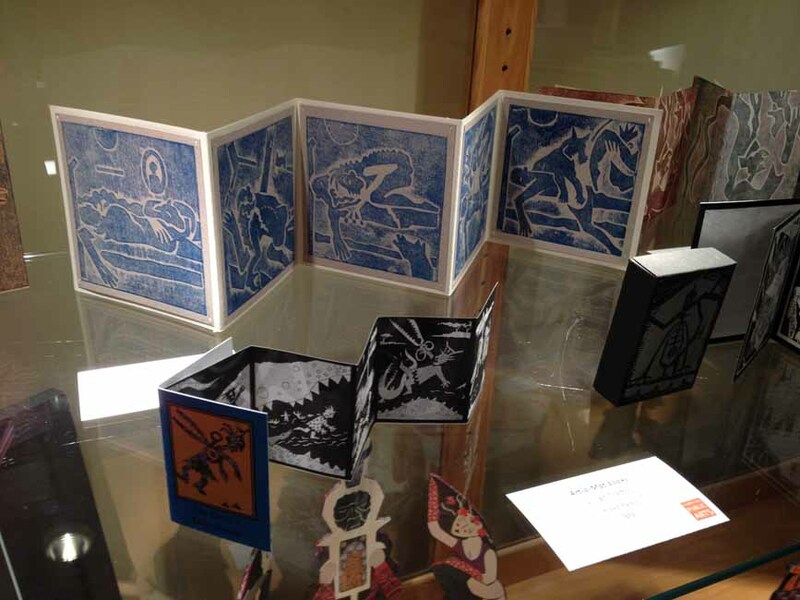 This entry was posted in Current work, Mountain South and tagged "woven together", artist's book, exhibits, Hickory Museum of Art. Bookmark the permalink. Two fine exhibits – congratulations, these are proud accomplishments! !